Using Prayer Beads – Part 1: What Are Prayer Beads , Anyway? As I’ve made strings of prayer beads for my Etsy shop, I kept coming across pagans and polytheists wanting to use these items in their personal practice, but not knowing how to actually get started. To address this, I wrote a pamphlet that is included with each order of beads through my shop but I have much more to say on the subject than can fit in a few columns of text. Since I don’t think you should have to buy prayer beads in order to learn how they can be used to enrich your personal spiritual practice, I decided to dedicate a blog entry or two (or three!) to the topic. First, it’s helpful to say outright that prayer beads, worry beads, and other beads-on-a-string have been used by many different faith traditions and cultural groups. This is quite possibly because beads themselves are very, very old. They are one of the first artificially crafted adornment used by human beings. Beads have been found in graves and burial sites from long before recorded history. The beads we find today dating from that period are generally stone or shell since these are the materials that endure being buried for thousands of years. In addition to stone and shell, today we use metal, wood, glass, plastic, ceramic, and composite beads most frequently; coral, pearl, fabric, and paper are also used for bead creation. Other items, such as tightly closed flower buds can also be strung on a string in the same manner as a bead. Popcorn and cranberries are still sometimes strung as part of a family’s Christmas decorations in the United States (and no doubt elsewhere). Today we generally associate prayer bead use with Catholic, Hindu, and Buddhist traditions; however, Muslims, Sikhs, and members of the Baha’i faith also use them. There is also growing interest among Protestant Christians in the use of prayer beads; other Christian traditions also make use of different types of counters to keep track of prayers. People who have no particular faith affiliation use them as a tactile focus during times of stress or when focusing on a particular dedicated course of action (such as sobriety). I personally think that prayer beads would be especially helpful to people who do distance healing on behalf of others or who frequently send energy towards a particular purpose. Prayer beads can be approached from a faith-oriented perspective or not. It’s not necessary to identify with a particular religion in order to use a string of prayer beads, especially if you are using a string not designed in adherence with any particular tradition. The beads I make, for instance, do not contain 108/54/27 beads like malas do nor are they organized in decades like a rosary – though I could certainly make some that do. I chose not to adhere to a traditional number or arrangement because the prayer beads I make aren’t specific to any tradition; each user can choose for themselves how to arrange their prayers. Prayers, of course, are primarily what prayer beads are used for. Each bead is a moment of focus where the user’s attention is given specifically to the name of a particular Power, their titles and celebratory greetings, a sacred formula, or a phrase created to affirm a specific purpose or goal. Prayer beads are very helpful when trying to focus the mind on a particular magickal or spiritual outcome. The repetition of, say, the intention of directing healing energy towards someone who has requested it, helps ensure that a full measure of energy is clearly sent. It’s one thing to simply say, “Yes, I’m sending energy now”; it’s quite another to sit down and say that for five or ten minutes. Prayer beads are excellent aids for meditation, too. A neutral, affirmative mantra or phrase helps focus the attention; this focus is further emphasized by the physical act of holding the beads between your fingers. 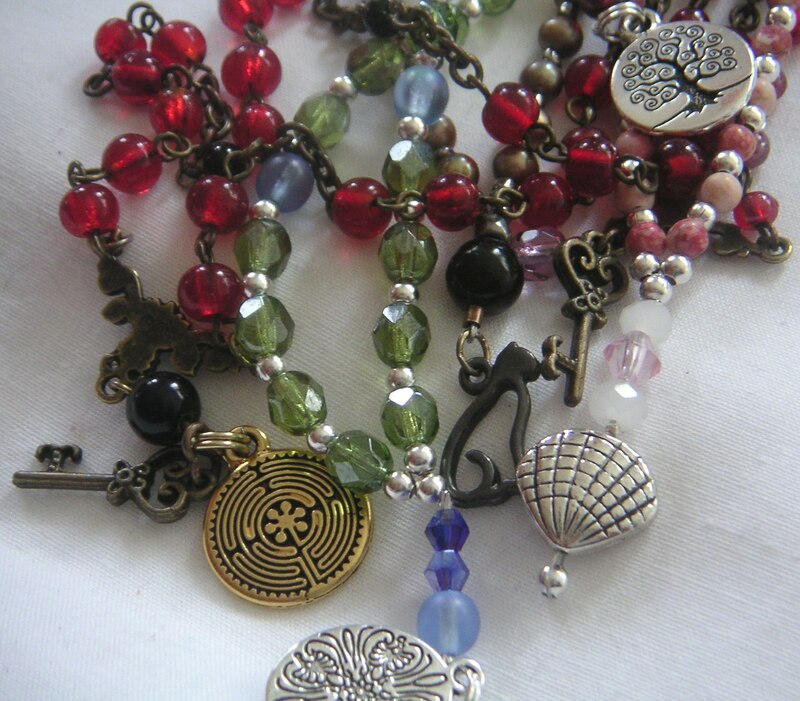 A string of prayer beads also lets you celebrate the name or titles of a beloved Power. Saying a sacred name over and over again firmly establishes Them in your mind and heart. Calling on a Power you wish to become acquainted with is also possible. Powers are quite sensitive to their names being called and will certainly respond sooner or later (though of course they might simply say, “Enough already; we’re not a compatible match.”). So that’s all for the first part of prayer bead basics. Next time I’ll talk about how to create your own prayers and spiritual formulas for use on a string of prayer beads.